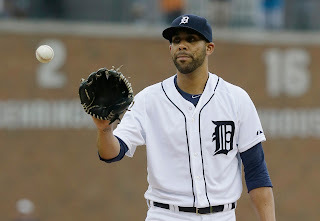 The Tigers have had a lot of issues this season as they've floundered to a .500 record, even after the All Star break. The most tangible explanation is their pitching is just mediocre. Ah, that was before they were one-hit Saturday night by the Orioles and lost despite an excellent start by David Price. One thing I'm perplexed about is why the Tigers aren't better at home. They have a 23-24 record at Comerica Park after Saturday's loss. Home field advantage in baseball is definitely a factor. Minnesota is 31-16 at home, 19-24 on the road. Kansas City is 30-16 at home, 24-19 on the road. Houston is 29-16 at home, 21-26 on the road. It's even more pronounced in the National League. St. Louis is 32-11 at home and Pittsburgh 32-16, while both clubs are playing roughly .500 ball on the road. The classic example of this is the Mets, 32-14 at home, 15-29 on the road. The Tigers have been OK on the road, 22-21. They just can't seem to shake loose at home, even against a team like Baltimore, which is just 18-27 on the road. Through the early games Saturday night, MLB home teams had a 739-631 record - just a shade under a 54 percent winning percentage. Travel the issue? Can't be. The lone division in which home teams have a losing record is the American League West. Does Comerica Park not fit the Tigers? It's a spacious in the outfield for sure, traditionally a triples haven. However, the Tigers have more range in the outfield than they've had in the recent past. 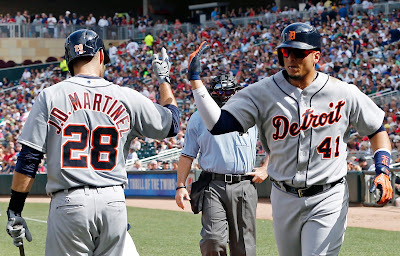 So the news about the Tigers to start the second half of the season - a home stand against .500 and sub .500 teams, like the Orioles and Mariners, should be good. Then again, this is a club that was destroyed at home by Milwaukee and Oakland this season, losing five of six to teams with a combined record of 80-103. Entering this year, the Tigers were 430-299 at Comerica Park since turning around their fortunes in 2006. Even the 2008 team, which lost 88 games, was 40-41 at home. Otherwise, the Tigers haven't been remotely close to having a losing record at home since '06. The losing at home is a trend the Tigers must change, or they have no chance in '15. 2012 - NL Cardinals (46-42) Braves (49-39); AL Rangers (53-35, but lost AL West to Oakland, which was 45-43 at 88 games) Orioles (46-42). 2013 - NL Reds (50-38) Pirates (53-35); AL Rays (48-40) Indians (46-42). 2014 - NL Giants (49-39) Pirates (47-41); AL Royals (46-42) A's (55-33). - Last time the Tigers went to the World Series in 2012, they were also 45-43 after 88 games. - In 2011, they Tigers were 46-42 and won AL Central going away. - In 2013 and 2014 the Tigers were 51-37 and 49-39 after 88 games. - In 2006, when they also reached the World Series, the Tigers were 59-29, but lost the AL Central title on last day of the season to Twins, who were 48-40 after 88 games. Jeff Ferrell has been under the radar in the Tigers' farm system - and with good reason. He was a 26th-round draft pick out of junior college. He was just another OK minor league starter his first years in professional baseball. But moved into the closer's role at Double-A Erie this season, he thrived with 12 saves in 13 opportunities, a 1.76 ERA and 35 strikeouts in 27 innings. His WHIP was below one. He was promoted to Triple-A Toledo recently and had a save in his first outing, striking out two, including former major leaguer Nick Franklin, against Durham (he faced the heart of the order). He's 24. Ferrell has an average fastball, but it's straight over the top and with some tilt (he's 6-foot-3). His calling card, though, is an outstanding changeup. It's a genuine outpitch and should translate well to MLB. He has excellent command of the baseball right now, rarely walking hitters. I do see where he has the potential to help the Tigers this season as a right-hander, but more in the front end rather than the back end of the bullpen. His experience as a starter would help him well in that regard.